The RIKEN BRC was established in January 2001 as a global not-for-profit bioresource center providing biological materials, technical services, and educational programs to private enterprises and academic organizations around the world. The mouse resource is part of the National BioResource Project (NBRP) for more than 20 species including animals, plants, microbes, cell lines and DNA. NBRP was founded by the Ministry of Education, Culture, Sports, Science and Technology of Japan. The mouse is the most useful and important experimental animal in biomedical research and is one of the major resources in RIKEN BRC. 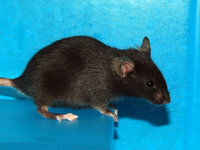 The overall goal of the experimental animal division is to collect valuable mouse strains and distribute high-quality, well-characterized inbred, mutant and genetically engineered mice to investigators. To this end, we shall select and collect mice strains important to the biomedical research community; rederive mice to a specific pathogen-free state; cryopreserve gametes and embryos; perform genotyping, phenotyping and infectious-disease monitoring to ensure the quality of the mice; and distribute mice to investigators as live mice, cryopreserved embryos or sperms. In the RIKEN BRC, all the collected living mice are detained in a quarantine facility equipped with disposable cages and filtered chambers. They are then examined by serological tests to detect eight important infectious microorganisms including lymphocytic choriomeningitis virus, mouse hepatitis virus, and ectromelia virus. Frozen embryos and sperm are also received for deposition of the mouse strains. Based on the results of microbiological monitoring in quarantine, the mice are transferred into Bio-bubble housing facilities under either negative or positive pressure and bred until an appropriate number of mice for clean up are produced. All strains are subjected to either in vitro fertilization or Caesarean section treatments. Diagnosed as Specific Pathogen Free by the final quarantine tests using embryo-recipient or foster mothers, the mice are transferred and maintained in the BRC main building. In special cases, reproductive techniques such as ovary transfer or intracytoplasmic sperm injection are used to clean up the strains. The SPF facility in the main building of the RIKEN BRC has been planned and constructed as a barrier facility for genetically engineered mice. The air conditioning of each mouse room is regulated and maintained at a constant temperature (24oC ± 2oC), relative humidity (55 ±10%) and ventilation rate (7 air changes/hr). All the animal rooms and corridors are supplied with HEPA-filtered fresh air with appropriate pressure to maintain the clean environment within the barrier facility. The mouse rooms are illuminated at 300 lux (1 m above the floor), with a light cycle of 12L/12D (08:00 on/20:00 off). Some strains are supplemented with commercially available paper nests. All supplies, including caging and water bottles, are autoclaved. Gamma-irradiated commercial food is supplied. Cage cleaning is carried out by well-instructed animal care technicians. These technicians maintain breeding records on cage cards and files on each strain. The mouse racks, floors and walls are regularly cleaned with a mild disinfectant solution. A card-key system safeguards the animal facility and helps to protect against inadvertent microbiological contamination. 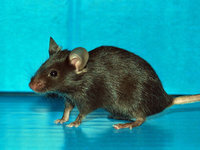 In the RIKEN BRC, the strains of mice that are frequently requested or difficult to freeze-store are maintained as live animals. Most strains are cryopreserved as embryos or germ cells whenever possible. The embryos are produced through in vitrofertilization and cryopreserved at the 2-cell stage. Mutant strains and genetically engineered strains are also stored as frozen sperms. Embryos are frozen in 1.8 ml plastic cryotubes by vitrification with a low-toxicity EFS (ethylene glycol, ficoll and sucrose) solution ( Kasai et al., 1990, J. Reprod. Fertil., 89: 91-97) or DAP213 (DMSO, acetamide and propylene glycol) as a cryoprotectant ( Nakao et al., 1997, Exp. Anim., 46:231-234). Mouse sperms are collected from the cauda epididymis, suspended in an 18% raffinose and 3% skim milk solution ( Nakagata, 2000, Mammalian Genome, 11: 572-576), embedded in plastic straws and freeze-stored in liquid nitrogen. ES cells of genetically engineered mice are also frozen-stored. In the RIKEN BRC, mutant strains that are difficult to breed and require special care are also maintained and preserved with the aid of reproductive technologies, such as in vitro fertilization, ovary transfer and intracytoplasmic sperm injection.